Grupo do Laboratorio Nacional de Computacão Científica (LNCC) de pesquisa em Computação Quântica no Brasil. Two new chapters: element distinctness algorithm and staggered model. New appendix: graph theory. 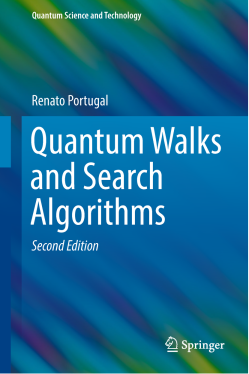 The revised edition of this book offers an extended overview of quantum walks and explains their role in building quantum algorithms, in particular search algorithms. Updated throughout, the book focuses on core topics including Grover's algorithm and the most important quantum walk models, such as the coined, continuous-time, and Szedgedy's quantum walk models. There is a new chapter describing the staggered quantum walk model. The chapter on spatial search algorithms has been rewritten to offer a more comprehensive approach and a new chapter describing the element distinctness algorithm has been added. There is a new appendix on graph theory highlighting the importance of graph theory to quantum walks. As before, the reader will benefit from the pedagogical elements of the book, which include exercises and references to deepen the reader's understanding, and guidelines for the use of computer programs to simulate the evolution of quantum walks. Post a correction, suggestion, or comment.